Can Thailand's Junta Reverse its Economic Decline? 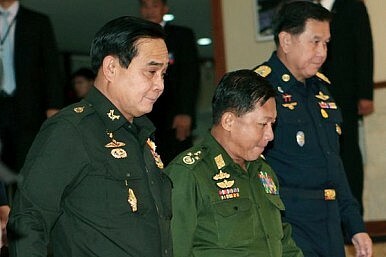 Thailand’s military government has ambitious goals, whether it can achieve them is a big question. Can Thailand’s military government achieve its ambitious 3.5 percent gross domestic product growth target and stave off social instability amid mounting signs of structural economic decline? As exports swoon amid a global slowdown and consumption gasps under high household debts, Thailand’s near-term growth will necessarily be state-led. Whether Prime Minister Prayut Chan-o-cha’s military administration lives up to the policy challenge will be determined by his ability to inject funds quickly and efficiently into the country’s sliding, trade-geared economy. While in-line with a wider regional slowdown driven by China’s faltering growth, Thailand’s economic slump is being increasingly politicized. Self-exiled former premier Thaksin Shinawatra, known for his growth-stoking populist policies while in office, said in recent foreign media interviews that Prayut’s government lacks the “talent” to drive the economy. Thaksin has consistently warned since the May 2014 coup that toppled his sister Yingluck Shinawatra’s populist administration that economic mismanagement would be the junta’s ultimate undoing. In an apparent response, Prayut’s administration published a four-page advertising supplement days later in the local English language Bangkok Post, outlining in flow chart fashion his 20-year vision for transforming Thailand into a “first world nation.” The glossy presentation critically portrayed Thaksin’s and Yingluck’s populism as “quick fix” and unsustainable while promoting Prayut’s still obscure “pracharat,” or “people’s state,” policy as a surer path to a high-income, knowledge-based economy. The model envisions a public-private-civil society nexus somehow transforming Thailand from a “failed” to “forefront” state. The current reality is that Thailand is moving in the opposite direction, with official statistics showing the country is actually de-industrializing. Total factory utilization fell below 63 percent in December, a recent nadir in a monthly contraction trend that began in 2014. While Thailand is still attracting new FDI, a Japan International Cooperation Agency report recently rated Thailand among the bottom five countries in Asia where Japanese companies were likely to invest in new industrial production. Exports account for around 70 percent of Thailand’s GDP; the Thai economy expanded 2.8 percent last year despite negative export growth. Analysts are divided over how much of Thailand’s industrial fade is structural due to waning competitiveness, and how much cyclical due to current soft global demand and low commodity prices. Those who see competitiveness issues note that Thailand’s electronics sector, which historically accounts for around one-third of total exports, is still stuck producing hard disc drives and other products obsolete to the cloud computing era. Others note crucial chemical exports are poised to evaporate as reserves in the Gulf of Thailand are depleted and global competition heats up for neighboring Myanmar’s off-shore resources. Prayut aims to lure new industrial investments through the promotion of special economic zones along the borders of neighboring countries with cheaper labor. SEZ development notably topped the economic policy priorities outlined in Prayut’s Bangkok Post placement and is consistent with the government’s aim to become a logistics hub in the newly enacted ASEAN Economic Community. However, activists are already agitating against Prayut’s use of executive authority to ram through the SEZs without environmental impact assessments, while analysts wonder whether prospective investors are more likely to invest directly in Cambodia, Laos and Myanmar, than indirectly through Thailand. For Prayut to have met the central bank’s previous 3.7 percent growth projection, since narrowed to 3.5 percent, bureaucrats would have needed to disburse 87 percent of all allocated budgets, according to a financial analyst with top-level contacts at the Ministry of Finance and Bank of Thailand. Thailand’s historic moving average for annual disbursals is closer to 70 percent, an inefficiency rooted in both systemic lethargy and fear of reprisals among bureaucrats who sign off on outlays that are often probed or cancelled after a change in government. Public investment expenditures were up 33 percent in 2015, albeit off a low base caused by the political paralysis and transitional disruption of the 2014 coup. Last year’s outlays accounted for 72 percent of the government’s allocated budgets. Prayut has bid to allay bureaucratic concerns by portraying his policies as part of a 20-year reform plan that the next elected government will be required under constitutional law to follow and implement. At the same time, new anti-corruption measures — including a law passed in November 2014 that makes civil servants criminally liable and financially responsible for losses caused by malfeasance — have reinforced a bureaucratic culture of fear. So, too, have prosecutions and jail terms handed down under the junta to state bank executives for their alleged wayward lending under previous governments. In February, Prayut’s Cabinet approved a 93 billion baht ($2.6 billion) stimulus package to finance new state loans for the rural sector, designed in part as emergency relief for widespread drought conditions. Finance Minister Somkid Jatusripitak, who implemented Thaksin’s populism in the same role in the 2000’s, has as Prayut’s top economic lieutenant prioritized state-backed low interest loans to rural borrowers and small and medium sized enterprises. The policy has had mixed results: while loans to SMEs run through private banks have nearly all been disbursed, credits earmarked for farmers managed by state agencies have stuck in red tape, with less than half the allocated funds extended. Bigger budgetary disbursement questions surround the 845-kilometer Thai-China high-speed railway project. The extended line aims to connect China through Laos to Thailand’s industrial east coast, opening the way for growth promoting trade but also possible politically sensitive waves of Chinese migration southward. While the two sides broke ceremonial ground on the $15.7 billion project in December, there are still unresolved issues surrounding shareholding, interest rates and development rights to land along the line that threaten to further delay construction now set to start in May. With Thailand’s history of slack disbursals and potential political complications to planned big ticket spending, analysts doubt Prayut will meet the central bank’s 3.5 percent growth target. While Thailand seems poised to outperform many of its regional peers, perceptions of the government’s policy performance will be determined largely by how funds are delivered and distributed at the struggling grass roots. And while Thaksin pillories Prayut’s economic acumen, pared of overt populist give-aways, the reality is he has drawn liberally on the same pool of talent and ideas as the ex-premier’s elected and aligned governments. Revised figures compound anxieties about Southeast Asia’s second-largest economy. The Trouble with Thailand's Economy Irregularities Cloud Thailand’s 2019 Election ResultsThailand 2019 Elections: Conflicting Claims as Final Result Wait ContinuesThailand's New Constitution: A Threat to Religious Freedom?Can Thailand Avoid the Middle-Income Trap?